Lightning dances upon the mountain top, swirling through the trees like a drunken reveler careening from partner to partner. Thunder, the ancient god of war, explodes all around, bursting into nooks and crannies, filling the air with dread. This may well have been the last full blown thunderstorm storm of the season, and Mother Nature wanted me to remember her wrath. She wants it to haunt me through the sparkling, jewelled shades of her autumn. She wants me to think of it whenever I see the delicate snowflakes of winter and the fragile blooms of spring. She wants me to remember. I won’t forget. This morning, the sky looks autumnal, and the last of the cold front may fire up again later this afternoon, but this was the season-changing weather I'd been waiting for. It wouldn't have needed to arrive with such a bang, but the cabin and the dogs and the cats and I survived. I had over 2" of rain in less than an hour. Wind roared through. The cabin was pelted with--was that hail? No, actually, it wasn't hail. It was the huge, fat acorns the oak trees produced this year hitting the side of the cabin as they were ripped from the trees. I don't think they cracked any of my windows, but I will need to check on that to be sure. The cats hid under the sofa and the bed. Dog dogged my heels all evening. If I stopped, he ran into me. If I turned around, I stepped on him. Baby Dog slept through it all. I dodged downed limbs and branches as I drove from the cabin this morning. Leaves are thick on the road, if not precisely yet a carpet. Yellow is soon going to be the predominant color around me. The color change seems to have moved forward overnight by leaps and bounds. The odd thing is that I'm finding trees where the right half is red or yellow and the left half still green. The change isn't showing up tree by tree, it's more like branch by branch. I'm starting to take a few photos of that, and I will start posting some of these half-changed trees soon. When it comes to wildflowers, I seem to have an unerring eye. If it’s pretty and attracts my eye, it turns out to an invasive species. Today’s pretty blue flower turns out to be no exception to that rule. 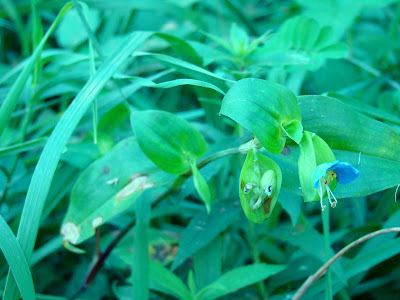 It’s an Asiatic dayflower, and I found it along the edge of the forest, along a seasonal stream. Dayflowers really do last just a day, disintegrating into a gelatinous mass after their single day in the sun. Part of the reason for this flower’s appearance in places where I wouldn’t expect to find invasive species is that the plant is quite resistant to herbicides, including Roundup. Apparently, it especially likes no-till corn and soybean fields, which may explain its original source in my area, though it can be found pretty much anywhere from Texas east. One of these days, if I ever have the time, I should do a detailed inventory of every plant I can find around the cabin. I would be interested to learn how many species eventually turn out to be invasive or introduced, though I’m afraid the answer to that question would only depress me. I'm still waiting for the promised cold front to arrive. This is the cold front that was originally predicted to arrive Monday night. Now it's supposed to get here on Friday. I'm at the point where I'll believe it when I see it, though the sun was red this morning, which at least suggests stormy weather ahead. I am desperate for fall. It's still quiet here at Roundtop, though Baby Dog has a way of making her own excitement. This morning she found a toad to chase and better still, a dead groundhog that in her mind was a Big, Hairy Monster. Groundhogs are something of a pest around the ski slopes. I don't mind them as much as Roundtop's staff seems to, but I can sympathize to a degree. One groundhog took up residence in a hole it excavated next to a storm water run-off grate. I'm not sure how the hog accomplished this since the grate is at the edge of a paved road, but somehow it did, creating a prairie dog-like exit hole and mound at the edge of the parking lot. Obviously, this location could cause problems for any number of legitimate reasons. Baby Dog has had to investigate both these particular holes every morning all summer as we walk out to the main road for our newspaper. Sometimes she even freezes on point like a hunting dog. Removing that hog seems a matter of safety, though when it comes to most of the rest of them, I'm willing to let them alone. Roundtop seems to disagree and routinely tries to eliminate them, without much long-term evidence of success. So it wasn't really a surprise when we came across one that been killed and then tossed into what should have been an out of the way spot, though nothing is really out of the way for Baby Dog. All I can say is that it's a good thing we don't live in a town or with close neighbors. Baby Dog saw that dead groundhog, and at 5:46 in the a.m. let out a howl and a roar that could have qualified her as the lead in the Hound of the Baskervilles. Her cry of outrage was likely heard in the next county. Truthfully, it never occurred to me that so much noise could come out of one little dog. 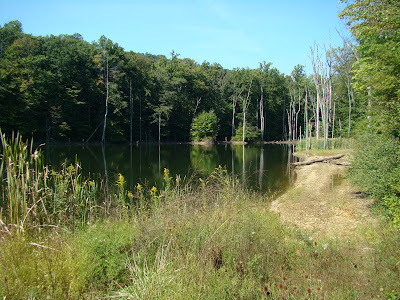 It was a long, deep keening kind of sound that made me jump so that I nearly dropped the leash. It was a noise that should have come out of an animal three times her size. Animals and birds that were still asleep suddenly stampeded in all directions away from us, which frankly only added to the din. Did I say there was no excitement around here at the moment? The next time I get bored, I'll just remember to bring Baby Dog along with me. The quiet won't last very long. Perhaps I’m just geared higher than I thought I was, but I’m not getting much in the way of stimulation from the forest environs right now. The march to fall and cool weather seems to have come to a full stop. I’m not finding new migrants or new signs of color change or much in the way of new things at all. I’m in need of something new to focus on, and I haven’t found it yet. I like to turn things around in my mind, look at things from all angles, wonder about where it came from or where it’s going. Can I turn it inside out? Can I shake it and see what happens? When I can’t find that something new to entertain or entrance me, I’m as restless as someone in need of a drug fix. And that’s how I feel at the moment. 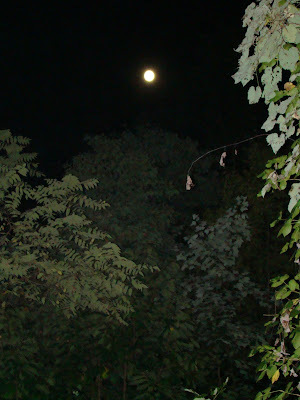 I wander as deeply into the woods as early darkness permits, hoping to notice something different or interesting to grab my attention—to no avail, I’m sorry to say. The fault, I know, is not in the woods or in the weather, but in myself. Dog and Baby Dog eye me suspiciously from the couch—feet hanging off the ends, heads pillowed on the arms. They are smart enough to know when to run and when to relax. I do not seem to be able to adapt to the quiet around me at the moment. Perhaps it is just the restlessness of a changing season, this disquiet I feel as I am surrounded by quiet. The dogs handle it better than I do, a sad commentary on human activity if ever there was one. The progress of the fall season has slowed to a glacial crawl--not today's glacial speed, but the speed at which glaciers used to move. 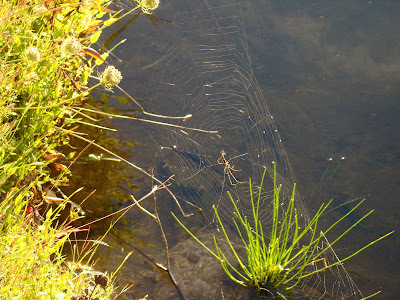 At Roundtop, even the wind is calm, giving spiders leave to build their webs between two blades of grass. Surely, the tiniest breeze would spell disaster for this web, but it has survived now for at least a week. The fish, however, have been eyeing it hungrily. I think the animals around me are in a holding pattern too. Usually, the white-tailed deer are at least beginning their annual rut. It's common to see them, sometimes by the dozens, in the fields at dusk. When the rut is really in full swing, driving after dark is hazardous. Many are killed, and many cars are damaged. This year, I am not yet seeing that congregation or deer nor the chasing around that follows it. And yet, I continue to see Roundtop's deer nearly every early morning, as they travel down to one or the other of the ponds an hour before dawn. South-bound migration of birds also seems to have stalled, birds lulled perhaps by the calm weather or perhaps simply by the lack of a tailwind to help them travel. This September is not unusual in some respects--the weather alternates between above and below normal daytime temperatures. For the new few days, above normal temperatures will prevail. What seems unusual is that even when the daytime temperatures are at or below normal levels, the nighttime temperature stays warmer than normal. Is that how global warming will work in the temperature zones? Is that why it doesn't seem real to some people? If the daytime temperatures were 5 degrees above normal all the time, it would be harder to ignore, I think. 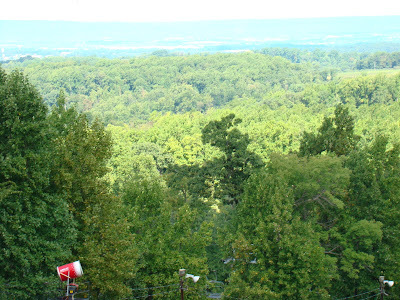 Every so often I walk up one of the slopes at Roundtop, as I like the open views, especially after living at the cabin, where a view of 15 feet is about all I get in the summer. I took this shot on Tuesday from the top of one of the bunny (the smaller) slopes, and as you can see, nothing much in the way of fall color change is yet evident. That surprised me a little, as the forest understory is starting to be quite yellow and more than a bit withered. I'm hoping to make the trip up one of the slopes each week, weather permitting, to see how the colors change from week to week. The current state of the season is that it switches from fall to late summer and back to fall again every other day or so. Shifts of in temperature of 20 degrees and more from day to evening seem to be the norm. I can start the day with a light sweater and by the end of it, I'm wearing a sleeveless shirt. Or, sometimes it goes the other way--starting in short-sleeves only to have the temperature take a dive within 8-10 hours so that I end up needing a sweat shirt. Windows open, windows closed--it's a guessing game where I always lose. 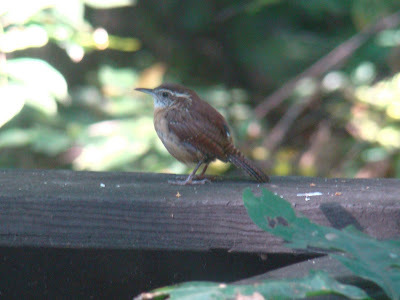 My slightly "off" photo this morning is of a little Carolina wren sitting on my deck railing. The photo is a little lacking in clarity as it was taken through double-paned and a not too clean glass window. This little cutie has decided the bird feeder that’s only a few feet away is his and no one else’s. So he’s guarding the feeder. Despite his best efforts, the other birds pretty much ignore him, though the littlest ones—like the chickadees—will move away momentarily. This morning I awoke earlier than I usually do and got up anyway so I could take Dog and Baby Dog for a longer walk. The Milky Way was high overhead and spectacular. The Great Warrior Orion, trailed by his faithful hound, dominated the sky that seemed to hold hundreds more stars than is normal. September is a month here when the humidity drops, the haze of summer dissipates, and the result is often days and days of spectacular clarity. And so it has been this year. Sometimes it feels as though each day is more beautiful than the one before it. The sky is cloudless and already turning a deeper blue than it was just a few weeks ago. This is partly because of the lower humidity but partly also from the lowering angle of the sun across the sky. In some years September can be rainy, and so these warm and gloriously clear days never materialize. Not this year. Nature is putting on one her best shows. Don't miss it. Late note: The Game Commission reports that the birds found dead along the Susquehanna River two weeks ago died of starvation and exposure. None of the birds tested had any food in their crops or gizzards. The weather had been cold, foggy and rainy for 8-9 days before the birds were found dead. At the time, reports suggested other birds--like waterfowl and shorebirds--were also reported dead, but none of these reports resulted in finding samples to submit for testing. 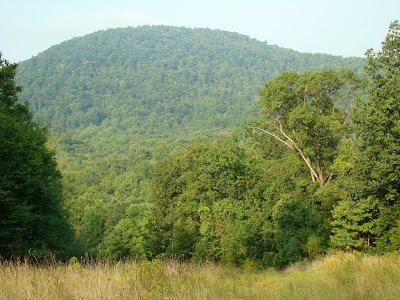 I have nothing but excuses, really, for why it has been so long since I've walked the old road that runs in the valley between Roundtop Mtn. and Nell's Hill. It has been too hot, too wet, I haven't had enough time-- the list could be longer but they are all still excuses. Yesterday, I finally put my excuses behind me and headed off the mountain and down into the valley. 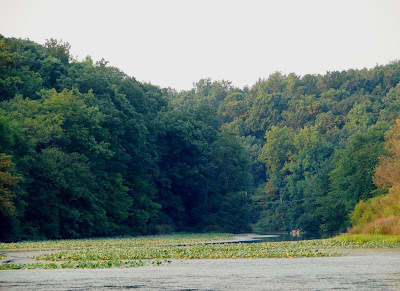 This pond is the first thing I see when I get to the bottom. 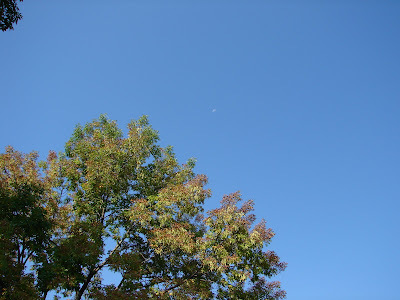 The sky, as you can see, was perfectly clear, a perfect September day. The quiet, except for blue jays who were outraged with my presence, was as deep and still as the pond. The trail through the valley is not long or particularly difficult. The woods are dark, and even in early afternoon, as my walk was, photography is difficult and not altogether satisfying. In some ways, taking photos down here is easier in winter, though there is often less then to take photos of. The winter light, at least, is better throughout. The stream that splits the valley was running faster than I expected to find it. The summer and the past few weeks have been dry. In some years the stream has gone almost completely dry, and even when that doesn't happen, it isn't unusual for it to run slowly in between its deep pools. 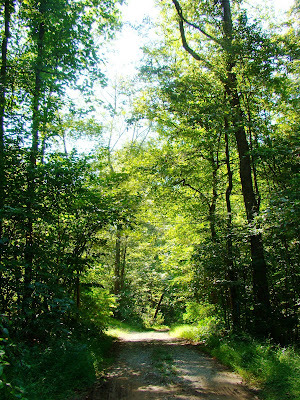 On this walk, I saw no wildlife--other than the outraged blue jays. So I was alone with the quiet of the woods on a windless day. Likely I was watched by forest residents that I didn't see. Now, I am angry with myself for not making this walk more often this summer. I have taken this spot and this walk for granted, and that is something I should never allow to happen. Life takes turns that we never expect, and I should not assume that either the forest or my own health will be there forever. I should enjoy both while I have them and take advantage of a cloudless sky wherever and whenever I find it. September is a good month for a lot of things beside bird migration. Today's photo is two stacks of (I think) ringless honey mushrooms. 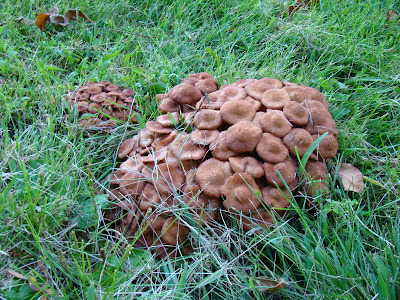 These mushrooms are found along the east coast, often around oak trees. September is the month when I find the most interesting-looking mushrooms here on the mountain. I rarely see the same ones from year to year, so that alone makes finding them fun. I've certainly never seen a clump like this before. The weather here has turned a bit chilly. The night time temperatures are now in the mid-40's. The lower temperatures will start to move the trees toward their color change. I can see the beginnings of it already. I've so far resisted building a fire or turning on the heat. In another few days it will warm up again, and in the meantime there's no reason why I can't wear a sweater indoors. In fact, by wearing a sweater inside, I can go in and out without having to stop to put one on or take it off. The house still stays fairly warm during the day, anyway. I am starting to bring the most tender houseplants inside, though I hope I can leave my fig tree outside for another few weeks. It's grown another foot this year, and I have no idea where I will put it. Well, I do sort of have an idea, but even if it fits, it will block access to my radio and at least one bookcase for the entire winter. So far, I've seen no sign that the annual deer rut, which makes driving after dark dangerous, has begun. This morning Dog and I did see several deer. They bounded away from us, one of them leaping into the air like a gazelle with every few steps. My bird feeders are starting to get a fair amount of activity. Yesterday, a Carolina wren spent an hour or so chasing away any other bird that tried to eat from it. It didn't matter if the other bird was larger or not. That scrappy little wren was trying to keep it all for himself. I also filled a large plant saucer with water and set it on the deck railing. Several birds used it, but one little chickadee came back and forth 6-7 times that I saw. I could tell it was the same bird by one feather that stood up on the top of its head. That one seems especially interested in the water. Fall is one of my favorite times of the year. I love the cooler temperatures, and a lot happens outside my door for me to keep an eye on. I can't ask for anything more than that. I’ve spent the last four days at a raptor conference sponsored by the Hawk Migration Association of North America (HMANA). Scientists, researchers, biologists and citizen scientists gathered to hear about the decline of the American Kestrel and the new statistical model for determining continent-wide raptor populations from migration counts. I’m sure this last sounds boring, but it’s really very exciting and marks the first time that hawkwatch site counts gathered from many previous seasons has been used to help keep track of the populations of our raptor species in a scientifically rigorous method. As the editor of HMANA’s journal, Hawk Migration Studies, I got to attend too, and was able to hang out with some of this continent’s most well known raptor experts. So first off, I attended the Kestrel symposium and heard several presentations on the decline of our smallest falcon. I wasn’t able to attend all of this symposium but the research I did hear was fascinating. The decline of the kestrel is real and appears to be worst in the east, though signs of it declining in the west are beginning. What is causing the decline? No one yet knows for sure but some of the latest information is pointing the direction for more research. One bander has data from the past 20 years of banding in Connecticut and has been showing a steady decline of the birds’ weights over that time. The birds leave their summer breeding grounds much lighter than when they arrive in the spring. This man speculates that many birds simply aren’t surviving migration. Each year the spring arrival weights and especially the weights of the birds migrating south in the fall are lighter than the previous year. Other information points to loss of habitat (grassland) along their migration routes, meaning that the birds must fly much further each day to find open grassland where they can refuel and continue their flight north. Some may simply starve before they reach their summer or their wintering grounds. A corollary to this is that the kestrel’s main source of food—grasshoppers—are declining from habitat loss and pesticide use. The second symposium I attended was on the state of North American Birds of Prey. The newly unveiled raptor population index (RPI) received perhaps the most attention. It is a very complicated (to me at least!) statistical model that uses hawkwatch count information from selected sites across the hemisphere to determine if specific species of raptors are increasing or decreasing. Overall, to no one’s surprise, the bald eagle, golden eagle, turkey vulture and black vulture are increasing. However, the most recent trends suggest that many species that were increasing through the 80’s and 90’s are now stabilizing or even decreasing. Merlin and Cooper’s Hawk are two species that are doing pretty well. Populations of Broad-winged Hawk seem pretty stable, too. The kestrel is declining. I won’t bore you with more conference minutiae, so tomorrow I’ll be back posting my more typical ruminations on what’s going on around the cabin. The temperature is dropping, and fall is knocking at the door. In the meantime, let me leave you with a link to the annual winter finch forecast. This man reports on finch food in the north to determine if and which of those irruptive little darlings will show up in the south this year. Keep those bird feeders filled this winter! The report looks like good news for those of us in the south. 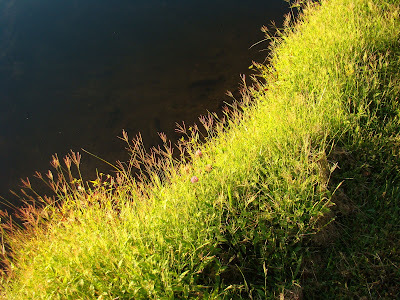 Today's photo is a simple one--morning light on the long grasses around one of Roundtop's ponds. It was a beautiful morning. Today I’m going to give a State of the Mountain report. The President gives a state of the union speech, and though I don’t oversee that much territory, I do pay attention to what’s going on around me. In a State of the Mountain report, I can record the changes that took place and report on how the mountain is doing on a day to day basis. First off, I can report that the "new pond" is settling in and starting to look more like a natural feature than it did last year. I still prefer the forest that was there to a pond, but at least it’s not another parking lot. I’ve seen more waterfowl than I ever did before the pond was built. Deer and fox drink from it regularly. Roundtop has worked on their tubing run this summer, building it higher and wider than before. At this point, the retaining wall is high enough to look a bit scary to me. I sure wouldn’t want to fall off that thing. No other new construction has trimmed the forest around the ski area, so the local animals and plants that I love aren’t being squeezed or stressed by that. Deer are plentiful this year, though I can say that every year. This year (and last) red foxes were seen regularly. Turkey are more plentiful now than was typical of my early years at the cabin. House finch seem to be increasing again, after being decimated by "house finch disease," which was really conjunctivitis. A local pair of kestrel have fledged as least one new falcon this year. I saw the three of them together on Sunday. This is also an improvement over the last several years, though a far cry from the years when kestrels were as common as, say, robins. Red-tailed hawk numbers seem to remain fairly constant. There’s always a pair an assorted younger ones around. Black vulture were in short supply this year, as they continue to range further northward. This year, they did not seem to nest in the area as before. I’ve seen them migrating southward already, though, so I believe the birds are simply nesting further north. Despite declines caused by habitat loss elsewhere, here on Roundtop wood thrush, ovenbirds and bluebirds are common and doing well. Southern bird species appear to be gaining a foothold—Carolina wren are now more common than ever. I’m still holding on to calling the majority of the chickadees that I see as black-capped and not Carolina chickadees, but it is true that I see Carolinas more frequently. I saw the first ever northern bobwhite here on the mountain just last week. Gypsy moths bypassed the mountain this year but I still feel as though I’m on a knife edge with that one. Next year may well be a different story. Wild raspberries were more plentiful than the year before, but still not in the numbers of several years ago. This year, hickory nuts and acorns are the biggest I’ve ever seen them, and though the numbers of them are excellent, it’s not the most of either that I’ve ever seen. Warming of the region does continue. The last of the leaf drop in the fall doesn't happen until early November now, when it used to occur in late October. Timing of the seasons was also off. Winter didn't feel like a normal winter until mid-January. Spring was also late, interruped after a normally-timed warm-up by a several weeks of a serioius cold snap. Summer was muggier and more overcast than usual, making it feel hotter than it actually was. All told, it was a pretty decent year, with no major losses and even a few modest gains. Note: I’ll be offline for the next several days, attending a HMANA conference on North American Birds of Prey. I’m especially looking forward to a symposium on the American Kestrel that will document its decline and hopefully identify some few causes for it. I’ll give a full conference report when I get back. The local produce has been amazing this year. I don't think I can ever remember a year when peaches, pears, corn, cantaloups, etc. have been so juicy and sweet. I've also been spoiled to by the weath of great local produce stands where I can buy things that were still on the vine or tree an hour before I bought them. So, it should come as no surprise that the wild "produce" is also pretty spectacular this year. 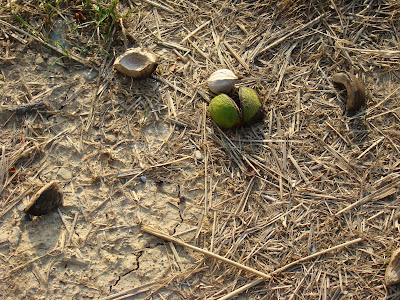 Today's photo shows a hickory nut and its outer shell. I gathered several pounds of these nuts in less than half an hour this weekend. The nuts came from just two trees, and the majority of my find came from a single tree. I'm planning to gather more before the squirrels get to them. 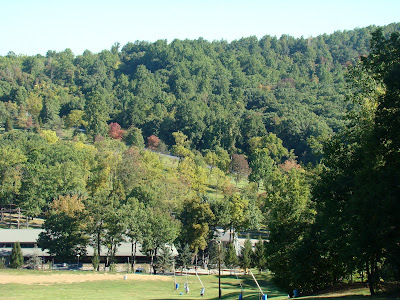 Here on the mountain, I live in the midst of what is mostly an oak and hickory forest. It's not nust the hickory trees that are producing lots of very large nuts. The acorns this year are highly impressive and very large too. Just to give you an example: my nearest neighbor has one of those aluminum carports that's positioned about 75 yards from my cabin. When one of those acorns falls on the carport, it sounds like a shot. It sets the dogs to barking. One night the sound woke me up from a sound sleep. I can't imagine what it sounds like from inside their house. Hickory nuts have an amazing flavor and aroma--just like butterscotch. My mother told me this weekend that my grandmother used to put hickory nuts in her butterscotch cookies, and I'm tempted to try that. Cracking open the hickory nuts isn't difficult, but picking the nuts out of the shell is. I have to use one of those nut pickers to pry out the nut. I never get pieces that are very large, and sometimes I think the work likely uses more calories than I get from the nuts, but the flavor is worth it. Besides, I have all winter to work on them. Roundtop has been quieter this week than I usually find it. The weather has been calm, if warmer than it should be, with no storms and little breeze to ruffle things. I’m sure the quietness is at least partly due to the fact that my morning walks are now made in near-complete darkness. The only real opportunity I have now to see what’s going on around me is in the evenings, when the day’s activities are already winding down. Even with that as a backdrop, the woods seem unusually quiet to me. I haven’t seen or heard the foxes for almost two weeks. I haven’t startled any deer this week either. The summer’s resident birds are starting to leave, so the woods are quieter without their voices, though I have the sense that their absence isn’t the whole story. Some of the resident birds seem oddly absent, too. All summer long Dog, Baby Dog and I have been accosted by the mockingbirds that haunted the bottom of my lane. They have been strangely absent this week, even in the evenings. As mockingbirds are year long residents, they should not be suddenly absent. So where are they? Is this quiet a real mystery or just an accident of the times I am out in the woods during the week? Today, I cannot say but I hope the weekend will bring a few answers. Sometimes I actually leave the mountain, though (except for work) I still rarely leave the forest. Last evening I left the mountain to head down to Pinchot Lake, just a few miles from the cabin. 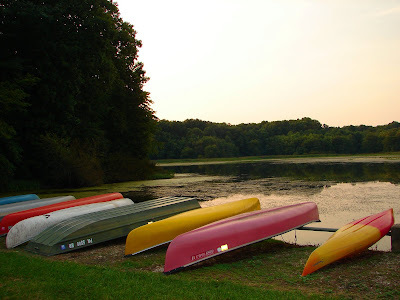 I was looking for signs of fall down around the lake, but the only things that really showed fall colors were the colors of these canoes along the lakeshore. This morning at the cabin I am engulfed in fog. Fog makes the landscape around me seem mysterious, perhaps even a bit dangerous. My footsteps sound louder. Forest noises travel further, enhanced and sometimes distorted by the fog. Outlines of familiar trees and surroundings are obscured in the fog, making the mountain feel like a different place than the one I see every day. Poets write entire poems about fog, and more poetic metaphors exist about fog than just about anything else I can think of. In Nova Scotia the imminent arrival of the Fundy Fog is reported and tracked on the local radio stations ("get your clothes off the line now, the fog will be here in 45 minutes"). 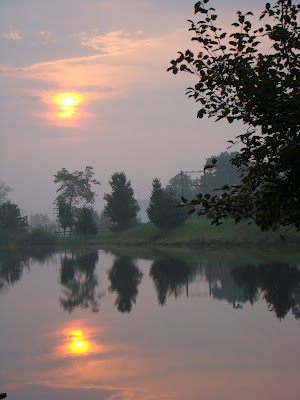 This morning’s fog at Roundtop is even more unusual and mysterious than is typical. Overhead, the sky was clear. I could see the stars and the last quarter moon clearly. But the top of the mountain and the next mountain to the west were invisible. They may as well not have been there at all for all I could see. Fog changes our perspective and makes the familiar seem strange. It’s a bit like taking a trip to a new place without leaving the old one. So this morning I find myself in unfamiliar territory, though I haven’t left the old. Lately when I've been out and about in the woods, I've been looking for signs of fall in the foliage. Often, I will see a hint of red or orange in a vine or a tree, but when I get close enough to actually study the color, I see that it's insect damage or leaf pods or some other kind of damage to the plant. So far, I actually haven't seen anything I can say with 100% certainty is color caused by the oncoming fall. The tree in today's photo had me fooled for a while, but the color change on it isn't fall either. Please don't tell the birds. I've already noticed flocks of robins and starlings heading south. They certainly think it's fall, or at least they think it's time to head south. I see groups of 10-20 robins or 50-100 starlings sweeping over Roundtop, landing briefly in the top of a tree, and then moving off again, as much in synchonicity as a school of fish. ----Dog, Baby Dog and I have been sleeping outside on the deck since the hottest weather broke a week or 10 days ago. The weather has simply been too nice to stay inside, even when inside is a cabin in the woods. I think the cicada symphony is finally starting to diminish a bit. I hope so, as they've been so loud I can't hear much else once they start in. ----Traditionally, I re-do or at least start to re-do my bird feeder on Labor Day each year. I don't feed the local birds during the hottest days of July and/or August. The seed either molds or sprouts before it is eaten. With cooler days and nights, it's time to start feeding again. My first bird of the new feeder years was a female cardinal, followed by a black-capped chickadee and a titmouse. ----I read in the paper earlier this week that when Siberia has a lot of snow cover in October, the northeast U.S. will get hit with cold weather and snow in January. Apparently, the snow cover on the other side of the globe causes high pressure that eventually crosses over the north pole and moves down to our side of the globe, especiallial along the northeast U.S. Who knew? So, if you want to check out how Siberia (and snow cover elsewhere too) is doing this fall, here's a great site at Rutgers University that shows it http://climate.rutgers.edu/snowcover/. Last year I reorganized my Roundtop birding records so I can better analyze the year to year differences in my monthly sightings. I am starting to see some interesting (to me at least) differences so I thought I’d post the results here. In 2007 I saw 36 species in August, two more than in 2006. However, it’s not just two more species--there’s quite a difference between the years in what those species are. In 2007, I didn’t see any nighthawks, catbirds or chimney swifts (migrants) nor did I find any downy woodpecker, blue jay, Canada Goose, Carolina wren or song sparrow (residents). However, in 2007 I did see stilt sandpiper, solitary sandpiper, kestrel, hummingbird, yellow-billed cuckoo (migrants) and house finch, bobwhite, screech owl and both chickadees (residents), though I didn’t have any of these on my 2006 list. The blue jay was the oddest resident species missing in August 2007. I didn’t see or hear them once this month, and they are usually quite common virtually everywhere in the forest. However, bright and early on September 1, I stepped ourside the tent and the first bird I heard was (you guessed it) a blue jay. For the rest of the weekend a day didn't go by without hearing or seeing one. At this point, I'm guessing they were simply re-nesting. Several of the summer residents have already gone missing, and it’s interesting to compare this year’s last sighting day with the previous year. In 2006 my last towhee sighting was Aug. 29; in 2007 it was Aug. 26. My last sighting of wood thrush this year was Aug. 4; it was Aug 10 in 2006. This year both species disappeared a few days earlier than last year, but the kingbird breaks this pattern. In 2006 my last sighting was Aug. 22, this year it was Aug. 26. Still, there’s a remarkable similarity in when these residents head south. The August temperature locally was 1 degree above normal. Interestingly, the average high temperature was actually a few tenths of a degree lower than average. However, the average low temperature (the night time temepature) was 2 degrees above normal. August 2007 was more overcast than usual, which moderated the usual nighttime temperatures. I don't think we can blame global warming for this one. 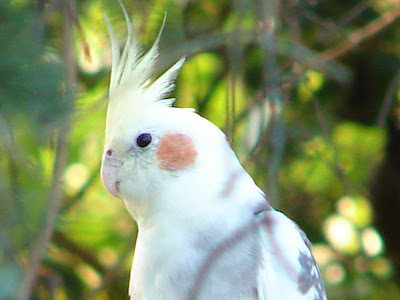 So why a photo of a cockatiel today? 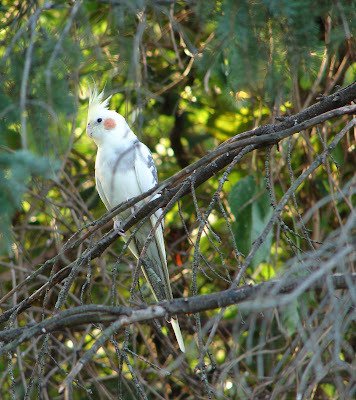 Well, when was the last time you saw a feral cockatiel? This bird has been feral since at least April, when it started showing up at bird feeders in the small town of Wellsville PA, where my sister lives. The bird roosts down along the creek that runs through the town and is canny enough to have eluded an attack by at least one hawk. I have no idea what will happen in another month or so. Will instinct kick in, causing the bird to migrate? Will it stay and if so how will it deal with the winter? Stay tuned.